Mary Doherty Johnson ... ex Connecticut, lives in Lawrence Kansas. Mary Johnson was born on March 29, 1922, in Winsted, CT. She attended the New Haven State Teacher’s College and pursued a career as an elementary teacher in New Haven. Mary taught at Troup Middle School in New until her retirement in 1982. An activist on both the national and local level, Johnson was a member of Spinsters Opposed to Nuclear Genocide (SONG), a New Haven based women’s affinity group. 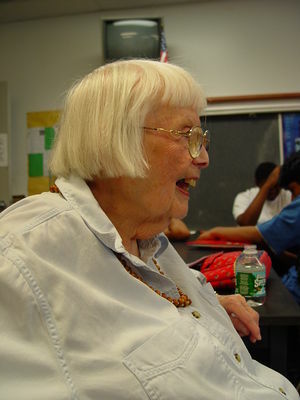 Mary joined the New Haven Federation of Teachers in 1967 and was a member of the Executive Board until her retirement. In 1974, Mary Johnson got involved in the national organizing effort of the United Farm Workers union, helping to strengthen a New Haven committee that leafleted, picketed, and passed out information about the boycott of Gallo wine (made from non-union picked grapes.) Over the years, she has been involved with many other organizations such as the May Day Celebration Committee; the Coalition to Stop Trident; the Pledge of Resistance; and the New Haven Coalition Against the War in the Gulf. She supported the efforts of the Yale labor unions and was active in the movement to pressure Yale to divest its holdings from apartheid South Africa in the 1980s. In the 1990s, she worked with a group of citizens who were outraged that the city of New Haven, under pressure from a downtown redeveloper, removed several key bus stops from the central downtown area. In New Haven, Conn., the PWW’s annual Amistad Awards are named for the slave ship that came to symbolize the abolitionist movement after a group of slaves revolted, taking the ship over in 1839. Carrie Saxon Perry, former mayor of Hartford and leader of that city’s NAACP, on hand to accept an award, urged the crowd to continue to fight against the ultra-right. She noted that while she was mayor, “they went after us when we took up the issue of health care,” but in that election cycle, all three Republican members of the City Council were ousted. While Republicans later retook seats, the progressive movement has re-surged in Hartford, as the Working Families Party has built a base around the People for Change Party that had ousted the Republicans before. This page was last modified on 25 October 2017, at 14:04.